Peters Books and Furniture has extended and redesigned its showroom to bring books and furniture together. It’s now possible to browse and buy books, plus the shelves to put them on, and the seating to sit on while you read them – all under one roof. Earlier this year, Peters opened a new wing of their usefully situated central Birmingham book showroom in order to showcase a larger range of their furniture products. It’s now easier than ever for their visitors to explore shelving, seating, rugs and display options in situ, and combine the activity with book-purchasing visits, or simply devote a whole visit entirely to furniture shopping. 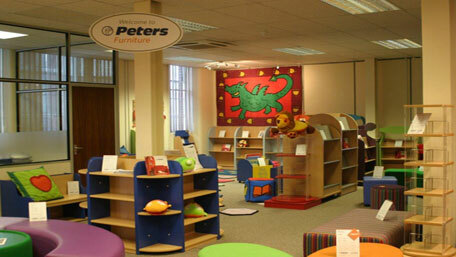 With exclusive ranges of shelving, seating, rugs and other soft furnishings, plus innovative display options and ideas, along with their free consultation and design service, Peters now offers a complete package for school libraries and young people's services. Children's furniture for schools and libraries. Birmingham - goodbye and hello!